Oral pain can have a number of causes, among them tooth decay, fracture or abscess, a broken or damaged filling, nightly teeth grinding, gum infection or wisdom teeth pain. No matter what the cause, you should see your dentist when you experience oral pain. If you still have your wisdom teeth, you may be wondering if you are experiencing wisdom teeth pain. How can you recognize this unique pain? Read on below. As the wisdom teeth come in, they can be very painful. You’ll feel wisdom teeth pain at the back of your mouth, behind your molars. If you look into a mirror, you may even notice that your wisdom teeth have begun to poke through your gums. The area might also be red, inflamed and tender to the touch. Some people, however, don’t have any visible symptoms of wisdom teeth pain. 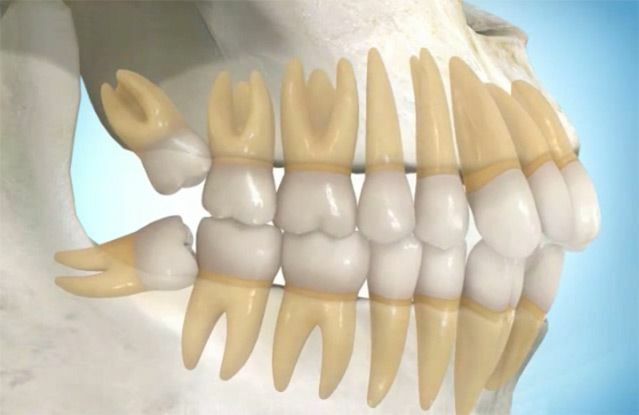 Wisdom teeth pain can be a sign of impacted wisdom teeth, which occurs when wisdom teeth are prevented from emerging by the jaw bone or other teeth. Impacted wisdom teeth are more difficult to remove, leave you at greater risk for complications from surgery, and can permanently damage bones and other teeth. Also, the longer wisdom teeth pain persists, the more likely it is that an infection will result from bacteria entering open tissue. Oral infections can have a negative impact on general systemic health. Other clues that your wisdom teeth could be impacted include jaw pain and tenderness, redness and swelling of the gums around the tooth, bad breath, or a bad taste when you bite down on food. Impacted wisdom teeth can also put you at risk for cysts, which are pockets of fluid that form around the tooth. Rarely, tumors can form around the tooth. Cysts and tumors can result in permanent damage to your jaw bone as well as your other teeth. Wisdom teeth pain is not always a sign that your wisdom teeth are impacted, but the longer you wait to see a dental professional, the more likely it is that your wisdom teeth can become impacted. If you think you may be experiencing wisdom teeth pain, you should make an appointment to see us. We will be able to tell you if your pain is actually wisdom teeth pain. At this stage, the most common solution for the pain is simply to have the wisdom teeth removed. A surgical or invasive procedure carries risk. Before proceeding, you should seek a second opinion from an appropriately qualified health practitioner.